ULTIMATE SHOWCASE AT OPERA HOUSE THIS SATURDAY! On Saturday, December 11th and Friday December 17th, new and emerging artists will get the opportunity to showcase their talents to the industries’ foremost talent scouts at The Ultimate Showcase. The event will host Canadian A&R heavyweight, Mark Spicoluk, who is the president of Underground Operations, and also works with Universal Music and Simmons Records. Spicoluk also appears in Much Musics’ DISBAND program and is known for his band Closet Monster and bassist for Avril Lavigne. Among his most celebrated signings and contributions to the music scene in Canada and beyond is the recently signed, LIGHTS. 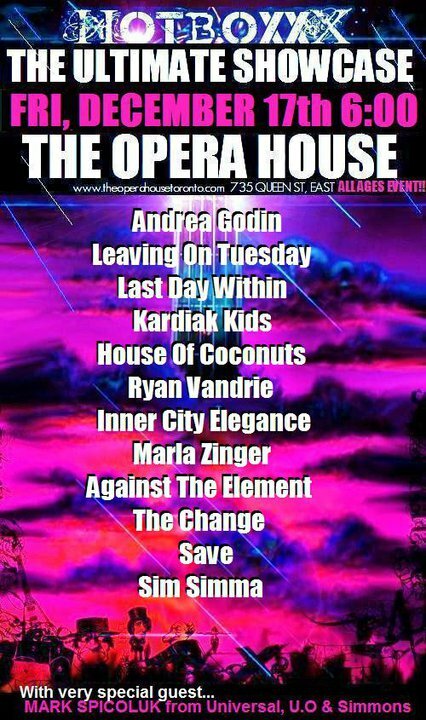 The event will feature EMERGING ARTISTS: Sima Fisher, Andrea Godin, Leaving on Tuesday, Last Day Within, Kardiak Kids, House of Coconuts, Ryan Vandrie, Inner City Elegance, Marla Zinger, Against the Elements, The Change, and Save.